Téa is 3 years old. 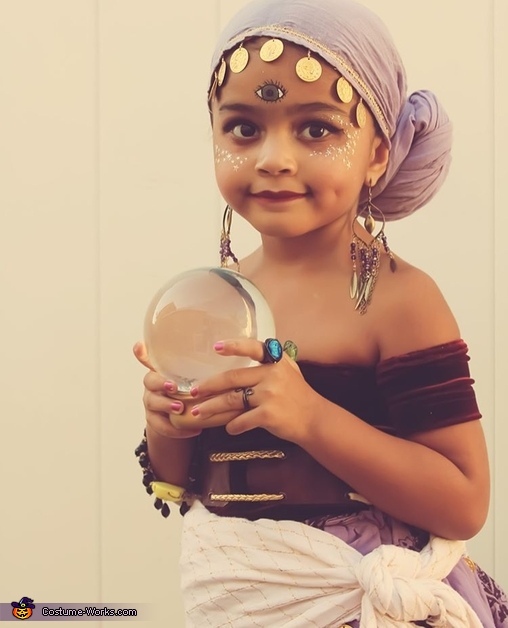 Like every year I think of what to make my little one I believe I stumbled on makeup for a fortune teller and that's where I thought hmmm maybe I should make her a whole outfit, she was Baby Frida Kahlo at age one and this felt similar to the look. I went to a local thrift store and brought three women dresses, a scarf, and belt, I cut them up and sewed them to create this look. To complete the look top I added my old jewelry, brought coins, a crystal ball and of course tarot cards.